“Well in the last update I claimed this was done, but as you can see it isn’t still. It’s like the classic adage that it takes 90% of the time to do the last 10% of the work. 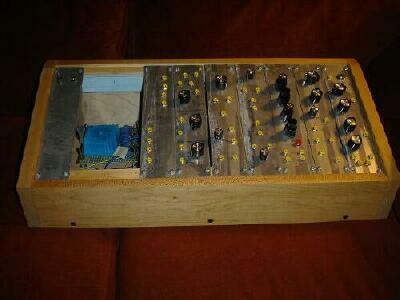 Anyway the Natural Synth has three noise generators and two triple low-frequency filters. It also has a Serge negative slew module, a diode ladder filter (like the VCS3 that Yamazaki Maso aka Masonna is obsessed with), and an APSI parametric eq. It’s really good for doing fluttery and swishy sounds, like water and leaves, and other times it does squiggly squeals and labored chuffing. I built it ‘wrong’ on purpose, and it really paid off, it feeds back internally! So when you patch it above the face plate, you also have to respect the way it patches itself internally.